When private health care provider Ramsay Health invited me to take part in their fast-food alternative campaign in the hope to encourage people to be more mindful of the food they’re eating, I couldn’t really say no. By developing alternatives to some of the nation’s favourite fast food options, the folks at Ramsay hope to make weight management and healthy lifestyles more achievable and enjoyable. Sounds like a win-win situation to me. My contribution is a home-made alternative to that bar-snack favourite, Buffalo Wings. Typically you’d find the wings for this recipe deep fried, served with fries, creamy coleslaw, lashings of blue-cheese dipping sauce and that famous Buffalo hot sauce. The beauty of this recipe is that you really don’t feel as if you’re losing anything by making and enjoy this meal at home. It’s super easy to create this feast in your own kitchen, and by making a few healthier replacements, you’ll find that this meal will be 100% enjoyable and yet it won’t feel like a blow-out. Oven-baking the wings yields fantastic results. I promise. You won’t feel cheated at all with this recipe. The fat content in the wings, means that you’ll still get your crispy skin but you won’t have fried it in yet more fat. 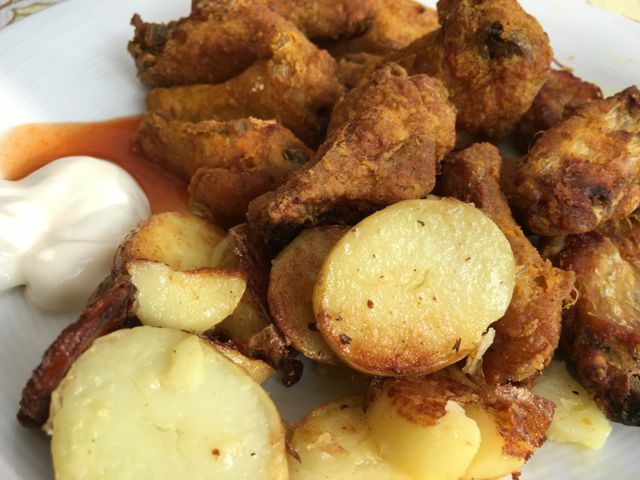 Instead of making the hot sauce and blue-cheese dip, simply serve your wings with sriracha chilli sauce and some light creme fraiche, you’ll get a similar taste/dipping experience but will have done away with the labour-intensive, calorie-intensive fast-food alternative. 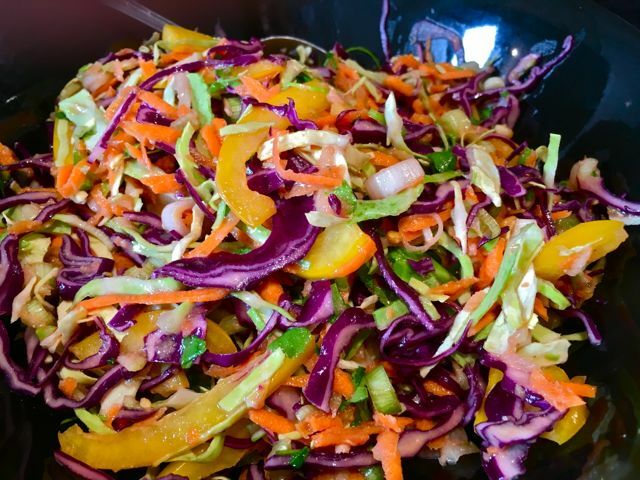 And when it comes to chips and coleslaw – these sautéed chats and Asian peanut-slaw will make you wonder why you hadn’t tried home-made sooner. Lightly coat the wing pieces in some olive oil. Put all the dry ingredients into a zip-lock bag and mix. Place all the wings into the bag, close it up and then roll the bag around to evenly coat all the wings in the seasoned flour. Place the wings on a baking tray, (you might need two) and put in the oven for about an hour. Boil the chat potatoes until they are almost cooked, but not quite. Leave to cool a bit, and then slice into discs. 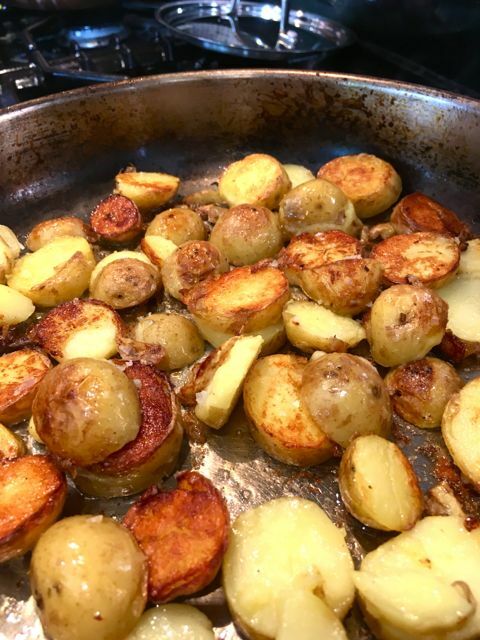 Heat a few tablespoons of olive oil in a frying pan, then place the potatoes in the oil. Leave the slices to fry for a while, to develop a crispy surface, about 5 minutes. Then you can use your flip to turn the slices and crisp up the other side. Sprinkle some salt flakes and pepper to season.